So confession. This dress is from last summer, but I never wore it until now! 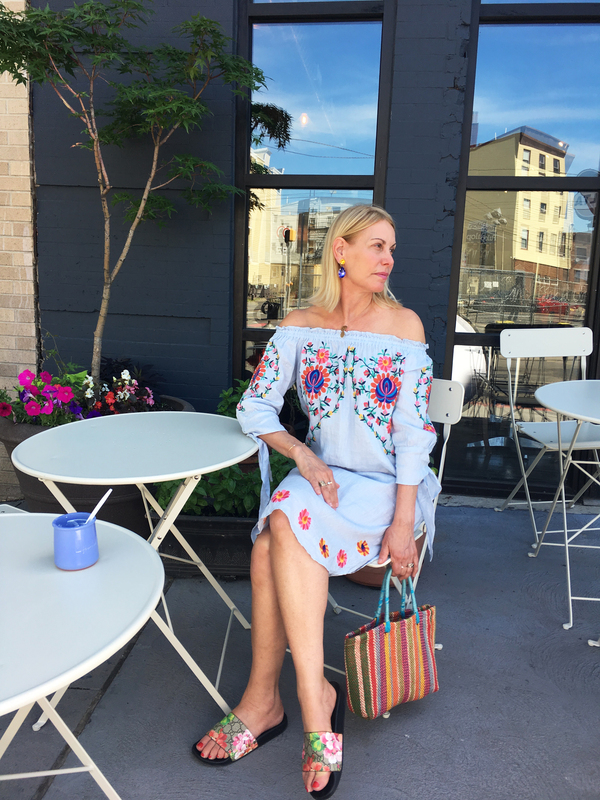 But its cotton/linen fabric, off-the-shoulder neckline and colorful boho embroidery are still very much on this summer’s scene, making it a chic and comfy silhouette you can just slip into and go. 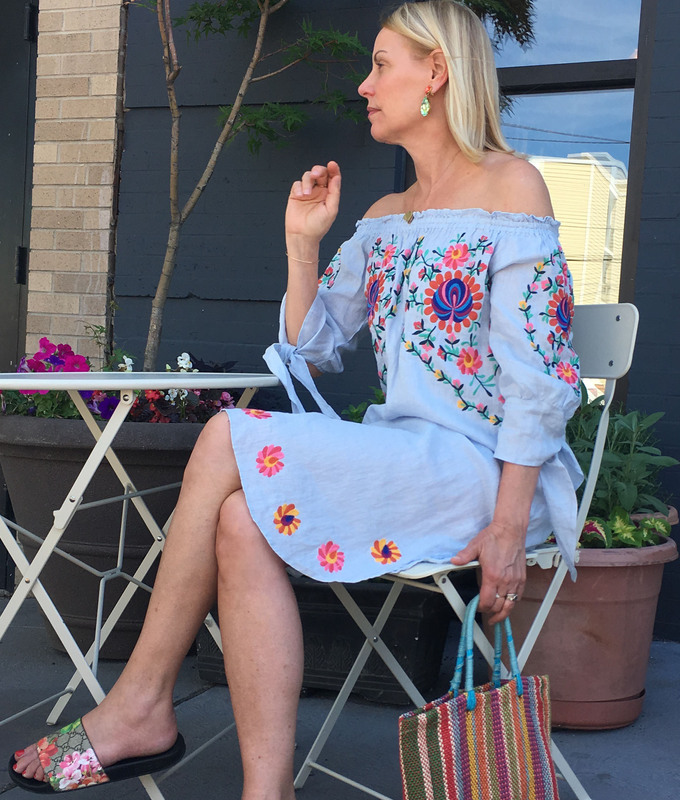 From lunch to brunch to date night, beach to street, city or country, everyday or vacay, everyone’s summer wardrobe can use a pick-me-up dress like this. And I think you’ll find lots to like from my similar dress links below. 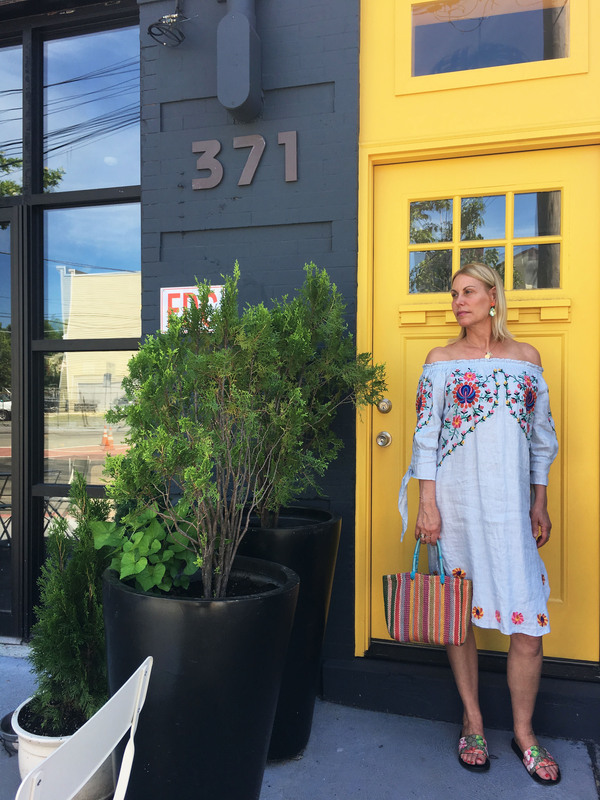 And…if you don’t need a dress, a boho embroidered top like this one from an earlier post just might be the ticket. 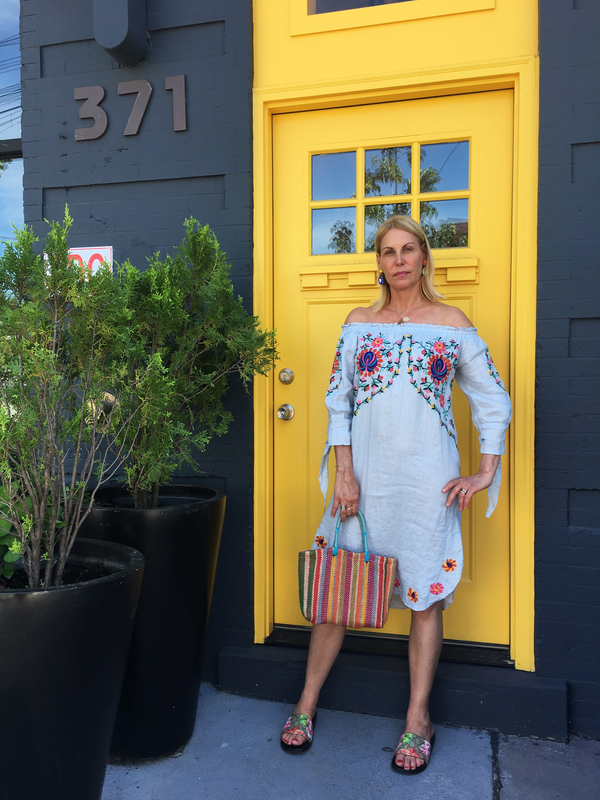 When it came to accessorizing this look, I kept the color coming — from my splurge-worthy Gucci Blooms Supreme Slide Sandals (worn with EVERYTHING since they arrived) to my cute and kind-of-funky (cheap!) 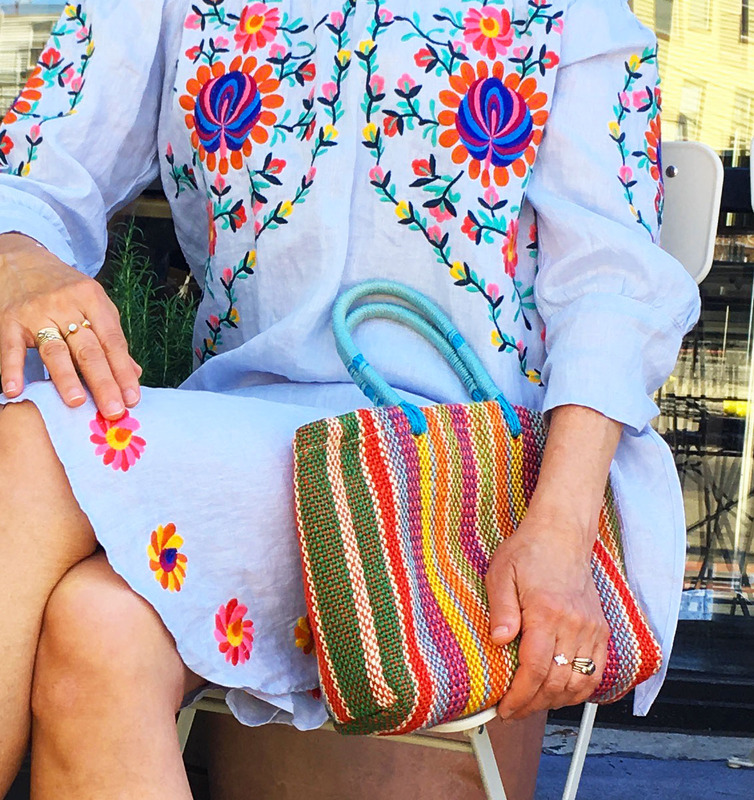 woven bag to my mismatched-yet-sophisticated statement earrings. Side note: when I wore these earrings to a wedding with a much dressier floral silk dress, they garnered quite a few compliments. Everyone loved that they didn’t match! Fashion statement and conversation piece? That’s my kind of accessory. Dress: (old, Zara) but loving this, this and this. Sandals: (Gucci) more affordable here, here and here. Bag: (old, Zara) similar here, here and here. 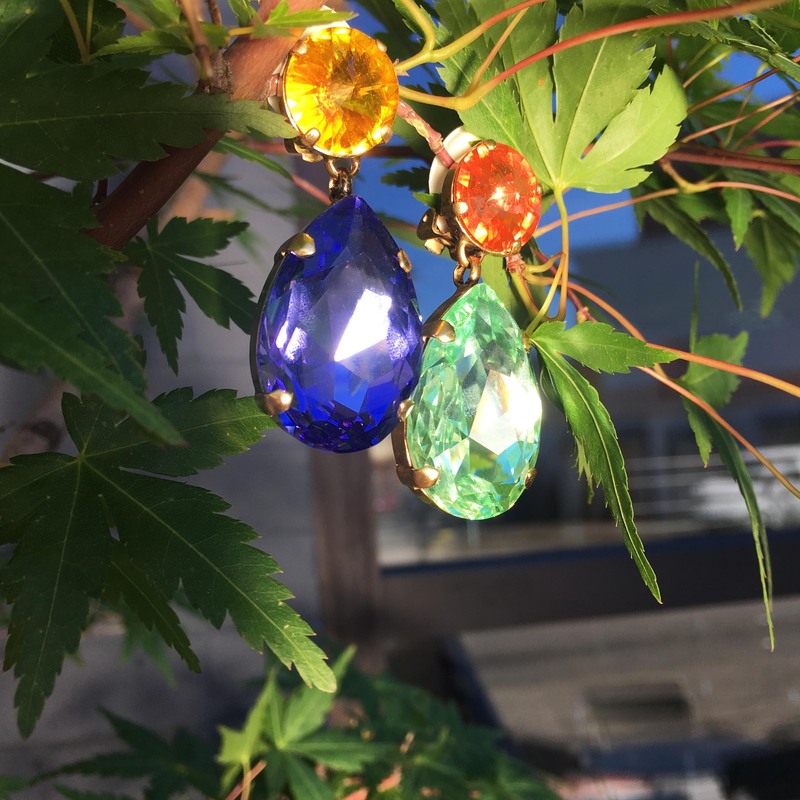 Earrings: (Roxanne Assoulin x Swarovski Crystal, sold out) but another version fabulous here and more affordable here and here. We took these photos at one of my favorite JC spots, Prato Bakery. Awesome coffee, fabulous Cantucci (think biscotti only better! ), and OMG focaccia sandwiches! Thank you, KMG! Another “cool” shoot with you!! Love this cute dress and the way you styled it. I honestly wouldn’t think of pairing all the colorful pieces together and it looks amazing. Super cute!! Thanks, Jenifer. I tend to be a bit understated when it comes to color, but sometimes you just have to go for it! This is such a pretty summer dress! Looks really cute off the shoulder. Love all the details too! And love your blog! Just subscribed! !